Chelsea heaved in search of a winner deep into stoppage time here, the locals howling in exasperation as Kasper Schmeichel turned Marcos Alonso's stoppage-time free-kick round the post, but plucking a victory from this mess of a display would have been an injustice. Too much of this was inadequate. Discontent is welling in these parts and, for the first time, some of it is being directed at the dug-out. There were boos when Eden Hazard, for the fourth time in as many starts, did not see out the game, and another disgruntled chorus at the final whistle. A third successive goalless draw reflects the reality that this team's domestic campaign has rather run aground. The champions have become too predictable, over-reliant upon their Belgian forward and with too few team-mates contributing at his side. 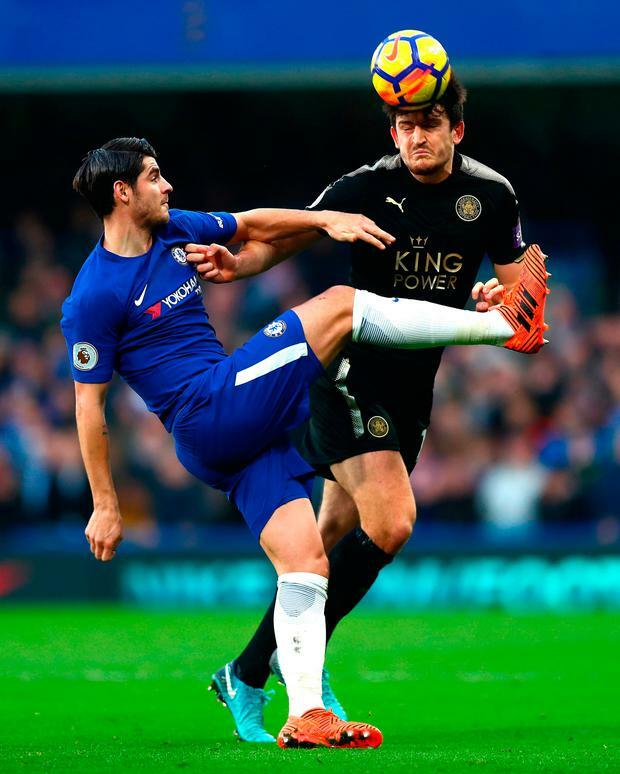 Álvaro Morata was anonymous against Leicester City team until booked three minutes from time, but the striker's crisis in confidence is seeping into other areas of this collective. In the aftermath of Schmeichel's save, Victor Moses sliced a shot so wide it almost drifted out for a throw-in. That was more typical of his team's display. The visitors appeared satisfied at the final whistle, largely as they had played the last 22 minutes with 10 men, but the better chances and more coherent play had always been theirs. Conte, in truth, had foreseen this would prove a distinctly awkward occasion. He had suggested Leicester were "the worst team for us (to face) at the moment" on the eve of this fixture, presumably referencing the visitors' energy and just how leggy Chelsea have appeared of late, though that did not excuse the initial slackness of this display. An experienced back three were tormented by the pace of Jamie Vardy and Riyad Mahrez, Gary Cahill left dizzied as the central pivot as the visitors swarmed forward through the opening half-hour. The England centre-half would retreat before the interval clutching his right hamstring. It was telling that the youthful Andreas Christensen, rather than David Luiz, was summoned as a replacement. Quite how the visitors failed to wound their hosts in that opening period was mystifying. Shinji Okazaki, poking awkwardly over the bar, and Vardy, who guided a shot into the side-netting, had both benefited from Ben Chilwell's fine delivery early on. 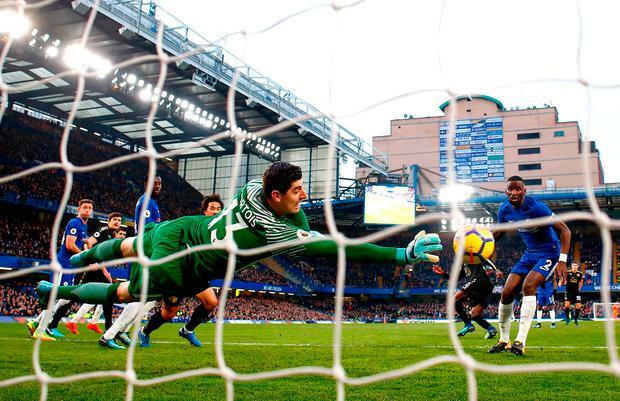 Wilfred Ndidi thought he had registered at Mahrez's deflected corner only for Thibaut Courtois to conjure a save at full stretch, with a succession of centres fizzed across Chelsea's goal-line somehow eluding Leicester's players. No visiting team could match Leicester's 12 first-half attempts since the first season of the Roman Abramovich era in south-west London. The champions have rarely been so disjointed under Conte's stewardship, their set-up clumsy and tentative in the face of their opponents' frantic press, and uncertainty prevailing with so many players straining to rediscover form and rhythm. The sight of Antonio Rüdiger being caught dawdling in inside his own box, with Vardy pinching possession, rather summed it all up. Even Eden Hazard laboured, desperation pushing him into taking one more touch, or one extra dribble, into trouble. Cesc Fàbregas forced Schmeichel into a pair of saves, but such incidents were isolated in the context of that opening period. Both players would be substituted before the hour, with plenty airing their ire at that decision. That reflected the majority's mood, the locals disgruntled by their team's inadequacies with Hazard established as their best source of a goal. They could redirect some frustration before too long as Mahrez was fortunate to avoid a caution after diving over Christensen's leg in search of a penalty. But the Algerian was a constant menace, drifting in-field to drag Chelsea's back-line out of position and seeing another attempt deflect off the young Dane to dribble agonisingly past the post with Courtois helpless. Somehow the hosts clung on and, in truth, they might normally have been rewarded. The brace of fouls from Chilwell, on the substitute Willian and Victor Moses, duly offered the reigning champions their opportunity with the left-back duly dismissed and Leicester's ambitions rather tempered in his absence. Yet the onslaught was only ever fitful in what time remained, with Harry Maguire and Aleksandar Dragovic resolute and City's composure retained. Having been depleted in number, securing a point would normally have felt like an achievement. In truth, the visitors must have departed knowing this contest should long have been settled in their favour. Jamie Holland Chelsea are under renewed scrutiny after a small group of fans sang vile chants about Mohamed Salah, with Liverpool branding the behaviour "unadulterated bigotry" in a withering statement. Nick Purewal Marcos Alonso's late header dragged a lacklustre Chelsea to a 1-0 Europa League win at Slavia Prague.